Ecorse, Michigan. 1904. "Steamer Detroit, Michigan Central transfer, stern view from under." 8x10 inch glass negative, Detroit Publishing Co. View full size. Submitted by delworthio on Fri, 05/27/2011 - 11:40am. Submitted by Histry2 on Fri, 05/27/2011 - 9:40am. A ferry so nice, they had to name it twice. Submitted by Green_Canoe on Fri, 05/27/2011 - 7:47am. I'm amazed at the beam that forms the sloping rail of the slipway: 18-24 inches square and about 50 feet of unbroken length that I can see. Good luck finding a piece of lumber like that today. Submitted by PatQ on Fri, 05/27/2011 - 1:52am. "Funny how all these timbers are on a slant. I wonder what this chock is for? YIKES, the whole ship is sliding sideways! SOMEBODY STOP IT!" Submitted by switzarch on Thu, 05/26/2011 - 11:31pm. What a grand shot. I hope there's a shot somewhere of this steamer so we can get a better idea of the design. Two neat touches: the tiny DANGER sign; today, you're talkin' temporary chain link, at least, and, the depth markings are Roman numerals; today they'd probably be Arabic. A new favourite shot. Submitted by kreriver on Thu, 05/26/2011 - 11:21pm. The Detroit operated as a railcar ferry between Detroit and Windsor on the Detroit River. 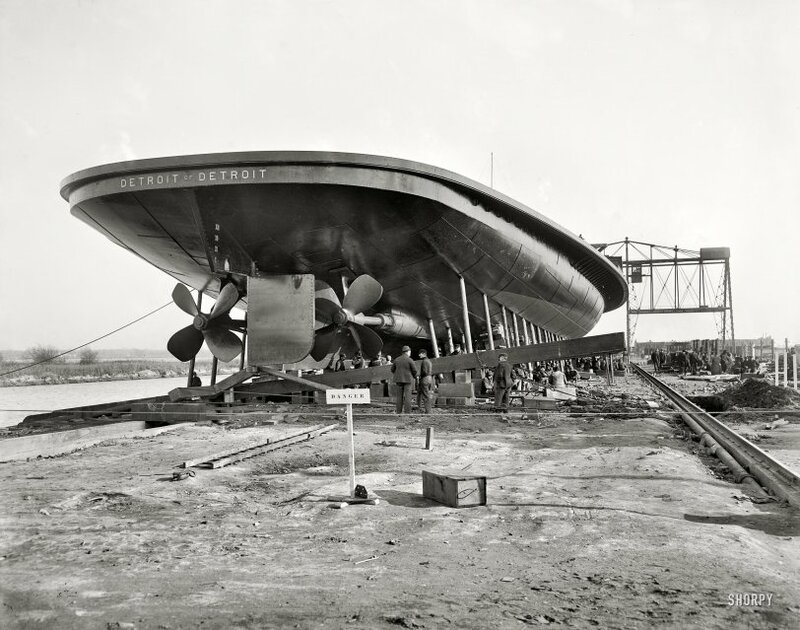 She had twin screws and a rudder on each end, all of which operated in both directions. As well as propelling the vessel, the bow screws also functioned to break winter ice. The deck portion of her bow was straight across, allowing it to fit against the loading apron. The Detroit was built with three tracks on her deck, with a capacity of 24 freight cars. The foregoing is from an excellent summary (with great pictures) of the Detroit in George W. Hilton’s book, “The Great Lakes Car Ferries, “ page 34. (Available online as a Google book.) The picture brings to mind my experience in the mid 60s of working on the GTW car ferry, City of Milwaukee. Never did get seasick, but was scared like never before during a storm. I cherish those memories now. Submitted by perpster on Thu, 05/26/2011 - 10:49pm. One of the Monitor class of ships, no doubt.